There once was a shepherd boy who worked for a rich livestock owner who had many sheep, but to the shepherd boy his lord had given only ten sheep to look after and care for. This shepherd boy looked after the sheep and every day took good care of them, took them where grazing was always green and fresh, he guided them to the best sources of water where the sheep were happy to eat the best grass and drink the best water that was around. The shepherd cured them when they were sick , he anointed them with oil to protect them from pests, protected them from wild animals that were threatening their safety and life. Every day, day after day the shepherd did his best to take care of the sheep that his master had given him to care for.The master was happy and pleased with how the shepherd boy took care of his sheep, but day after day his master chose to entrust him only with those tens. Eery now and then but rarely, however, his master gave him another sheep to care for , often a little lamb or a sickly one who needed extra care. Nevertheless the shepherd boy in the beginning was happy about all this, but as time went by, the shepherd began to be dissatisfied and unhappy because he had only a few sheep in “his” flock. Moreover, he thought he was a faithful pastor and he took good care of the sheep, but he could not understand why he could not have more sheep entrusted to him? Yet his master was pleased with how he took care of them, the shepherd boy was doing everything possible in obedience to the written instructions of his master. Why, then, had he so few sheep? Why did he have only the most difficult to treat and care for? What was the problem? He could not understand!His master said to him however, that if he wanted more sheep he had to go looking for those who were lost. There were many lost ones and any he could find he could care for. So the shepherd began to put all his strength and his ability to go to try to pick up the largest number of goats possible, often by doing so, he found also a sheep or two.With the passing of time, however, the shepherd boy realized that he could not control the goats. The goats ate everything, contaminating the sheep’s pastures and water, the sheep were treated badly and gored by the goats and often walked away with them and got lost all the time. It was more the time spent trying to recover the goats that he would spend taking care of the few sheep he had. Meanwhile, the sheep became ill, they could no longer feed in the right way because the shepherd boy had to spend his time after the goats and even some sheep often swayed by the goat’s stubbornness and rebellious and independent nature followed them straying away form the flock. Dear friends, brothers and pastors, what is the problem in this story ? I think most of you already have a good idea of what is happening in this story and what it refers to. This obviously is not just a parable or just a story, this is the true condition and the attitude of the majority of pastors who are out there now a days. The problem is that the attitude of the pastors today, unfortunately, are the same as this shepherd boy is facing in the story we just read.There are very basic problems in the church today and these problems have been persisting for a long time, making the life of the shepherds and consequently also the rest of the church communities, difficult and at times almost unbearable. There are so many leaders in the church who are angry , disappointed, depressed and unhappy , some are even angry with God, because they assert that “their” flock is not growing, especially not in number (also in stature, that’s what they should be more preoccupied with). First of all I would like to say to those shepherds, the first basic problem that exists in their reasoning is this, the flock like in the story does not belong to them! The flock, the sheep, belong to God! He and only He is the master ! You, we are only stewards, shepherds, under shepherds, managers, let’s call ourselves what we want but, the sheep do not belong to us, they do not belong to you, they belong to God! We just have to be faithful stewards of the sheep that our Father has entrusted to us, being 10, being100 or 1000, no matter how many they are! The only reward that God will give us, however, will be for the faithfulness with which we have been operating in our lives and I say to you not only in the church but also at work and in the family. At the beginning, as we see in the story, the shepherd was faithful, he was happy to take care of the ten sheep and occasionally one or two were added to the flock. The shepherd was faithful and satisfied, he did all that his lord told him to do and this was good, this is what God wants from us , faithfulness and obedience, reminding us that the Lord has told us that if we are not faithful in the little things how can we be faithful in bigger? If we are faithful in the little He will give us bigger things to take care of. Often however, we lose sight of the fact that if the Lord calls us to be faithful and to take care of 10 sheep this does not necessarily mean He will give us 100 in this life or that we will have 100, but it could be that our greatest reward is in eternal life. If we fail to be faithful, happy and satisfied with what God gives us in care now, how can we expect that He will give us more, both now and in eternity? How many pastors have started well and then because of false doctrines and false expectations and because of personal ambitions and desires of grandeur have fallen in depression and dissatisfaction, and even in worse things? Many! This thing is perhaps the most insidious and subtle trap in which a pastor can fall.I would like to ask you: who has put this burden on you? Who put this weight on you? Who told you that you have to have the largest and most numerous and prosperous flock in the valley? Not God, that’s for sure. Is that the will of God for you? For me? Maybe it is or maybe not! If it is, it will be so, if it is not so it will never be in spite of all your useless efforts. God looks at our obedience and our faithfulness to what He has entrusted to us and not whether or not we produce mind-boggling numbers of converts. What should we say then, that the prophet Jeremiah was not successful in his ministry? From whose point of view? From the human point of view, point of view of the world, from the corporate standpoint maybe his ministry was a real failure, but from God’s point of view? No! Absolutely not! Jeremiah faithfully preached and no one repented. Of course if he had maybe compared himself to Jonah where an entire city repented at his message that he preached and he even preached it unwillingly, he would have surely reacted like the shepherd in the story and how many pastors react when they compare themselves to others who are more successful than them. What shall we say of Ezekiel? He also had the same results as Jeremiah, but according to God did these two men have more or less success than Jonah? Neither more nor less, because they did exactly what God had called them to do. I would venture to say that there is a lesson to be learned here, and it’s this one, that sometimes people do things for God unwillingly and He brings about great results nevertheless and others do things faithfully and obediently and God yields no results. So does results always determine success? Obviously not! What shall we say then of Jesus, the Son of God, He did ALL that the Father told him to do, He lived in perfect obedience to the law and the will of God , He preached the word of God faithfully, performed miracles, cured hundreds of thousands of people, cast out demons, he created food for over 30,000 people and at the end of His ministry on this earth what results did He have from the human point of view? Three years of God’s almighty power and an entire nation rejected Him, his human family thought he was crazy, twelve of his closest disciples left him alone in His greatest hour of need, one of His promised to die with him then denied him, not once three times, another betrayed him. He was falsely accused of things he never said and did, for these false accusations He was scourged, beaten and crucified. At the end of all this,120 people, maybe 500 in total remained that had been permanently changed by the ministry of Jesus. I repeat, the Son of God, the Creator of heaven and earth, God Almighty worked on earth for three years, not me, not you, dear brother, God Almighty! At the end of three years only 500 people? A failure? No! Not at all! It was a successful ministry and the ministry was and is the most successful, yet from the point of view of God there are many more people perishing than those who are saved, is it then a failure? No! Because everything happens always and only and exactly how God wants it to be and this is not ever a failure. Let us remember again, the flock belongs to God and not to us and He is the good shepherd who goes in search of the lost sheep. Yes it is true that God has commanded us to do the same, but not to do it by ourselves, not on our own and not for our personal ambitions and not in our own way, but in the way and how He pleases.We can try to increase the flock of God because we are envious of other pastors and other flocks , which of others are not, they are God’s flock. 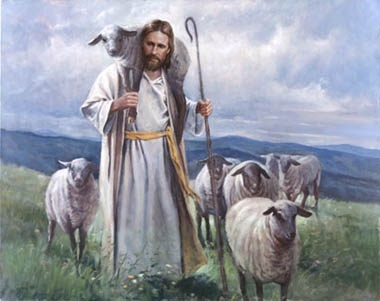 We cannot expect God to give us a larger flock because we see others who are more numerous than “ours” and we are busy only because we try to be like “that other shepherd” or we want our community to be “like the other communities.”The sheep that God has given us to care for are His and we must take care of them and be satisfied and happy that God gave us this great privilege, no matter how many there are, ten or a hundred it is all the same.There are unfortunately too many false notions and wrong motives to evangelize, that is, go looking for the lost sheep. Unfortunately, these are things that are transmitted in the church as these falsehoods have become an infection that has infected and has sickened nearly the whole church. I believe that most of the church in the world evangelizes with the wrong motives and for the wrong reasons, with the wrong methods and according to wrong doctrines. This happens for the subtle lies that are fed into the church as leaven that eventually leavens the whole lump. Again, these falsehoods are subtle and sometimes difficult to discern especially if the believers are immersed in churches that promote false doctrines and also churches where sound doctrine rules are not immune to these falsehoods.First of all this is because all shepherd of God’s flock are human and subject to temptation. The temptations of envy and of wrong motives. Secondly, because even the shepherds and then the believers who are instructed by the shepherds have been contaminated in some way by the falsity of some wrong doctrines which have been sown in the church. In many Christian circles the answer to this question is the following: “we have to evangelize because if not people go to hell.” They taught us this for years, in fact if we do not evangelize people will go into perdition without Christ. This is partly true, but partly it is not. How can this be? Simple! Now some one will no doubt freak out at this answer! If we believe in the biblical doctrine of the sovereign election of God we will see that this concept is true only in part, in other words ALL the people that God wants to save will be saved these are the people that as a result want to be saved and they will be saved and will not go into perdition. Attention now, only people who do not want to be saved will perish, because they do not want salvation anyway.Understand the concept? Nobody would want to believe in Christ and be saved if it were not ONLY for the wonderful mercy and grace of God that He bestowed upon those upon whom He desires to pour it on. Otherwise, if it were not so there would be no hope for anyone! Where is the injustice in all this? There is none, it does not exist! Just read and understand the epistle to the Romans and you will understand that this thing is in fact so, chapter 9 is ultra clear on this concept as indeed is the whole counsel of God, and especially the New Testament, the words of the Lord Jesus, of Paul and Peter, there’s no question , at least for me and many others there is no question. Romans 9:11-24 ( in fact, when the children were not yet born and had not done any good or evil , that the purpose of God might stand, according to election and not because of works, but of Him who calls ) , 12 she was told , “The elder shall serve the younger” , 13 as it is written : ” Jacob I loved, but Esau I hated .” 14 What shall we say then ? Is there unrighteousness with God ? May it never be . 15 For he saith to Moses, “I will have mercy on whom I have mercy , and I will have compassion on whom I have compassion .” 16 So then it is not of man who wills, nor of him that runneth , but of God who shows mercy . 17 For the Scripture says to Pharaoh, ” For this reason I raised you up , to show in thee my power and that my name may be declared throughout all the earth.” 18 So he has mercy on whom He will and hardens whom He desires. 19 You will tell me then , “Why does He still find fault ? For who hath resisted his will? “. 20 Rather, who are you , O man, do dispute against God? Shall the thing formed say to him who formed it , ‘Why did you make me like this? “. 21 He has not the potter authority on clay, to make from the same lump one vessel unto honor, and another unto dishonor ? 22 What if God, willing to show his wrath and to make His power known, endured with much longsuffering the vessels of wrath prepared for destruction ? 23 And that he might make known the riches of his glory on the vessels of mercy , which he has prepared beforehand for glory , 24 even us whom he has called , not of the Jews only but also of the Gentiles ? So it is true that God has chosen the method , that is, the preaching of the Gospel (the work of Christ on the cross and His resurrection ) and the vehicle for applying the method that is the Holy Spirit working in the church through believers and evangelists, but God has also chosen upon whom He wants to have mercy. John 6:43-47 Jesus answered them, ” Do not murmur among yourselves . 44 No one can come to me unless drawn by the Father who sent me , and I will raise him up at the last day. 45 It is written in the prophets : “They will all be taught by God.” Everyone who has heard the Father and learned from him comes to me. 46 Because no one has seen the Father, save he which is of God, he hath seen the Father . 47 Truly, truly, I say to you , whoever believes in me has eternal life. John 17:1-3 These things spake Jesus, and lifted up his eyes to heaven and said, ” Father, the hour has come, glorify thy Son , that the Son may glorify you , 2 since thou hast given him power over all flesh, that he should give eternal life to all whom thou hast given him. 3 And this is life eternal , that they might know thee the only true God, and Jesus Christ whom thou hast sent . The concept is more than clear, in the words of Jesus we understand that it is only those who believe in Him that are saved … but this is not absolutely independent of the fact that they are only those whom the Father has chosen to give to Christ who go to Christ and only to them that Christ has authority to give eternal life. John 6:65-66 “For this reason I said that no man can come unto me, except it be given him by my Father .” 66 From that time many of his disciples went back, and walked no more with him. If we believe in this sound biblical doctrine then we must also believe that whom God wants to save those will be saved and they will be the ones who will believe! Certainly it will be through the work of the church, but be careful now, only through the will and the method prescribed by God and only through the power of His word and His Spirit. Only this will bring about REAL SALVATION! LOVE especially for God (because Jesus said “ He who loves me will obey my commandments”) and then for people. To say that people for whom Christ died will perish dear friends would be a real failure and not only that, it is blasphemy! The sacrifice and the redemptive work of Christ was, is and always will be a complete success in every detail of it ! Nothing that God has done and planned was, is or will ever be a failure, even when we talk about only one person for whom Jesus died . How should we evangelize ? Ephesians 2:1-10 You hath he quickened , who were dead in trespasses and sins , 2 in which you once walked , following the course of this world, according to the prince of the power of the air , the spirit that now worketh in the the sons of disobedience , 3 among whom also we all once lived in the lusts of our flesh, fulfilling the desires of the flesh and of the mind, and were by nature the children of wrath, even as others. 4 But God, who is rich in mercy, for his great love wherewith he loved us, 5 even when we were dead in trespasses, made us alive together with Christ ( by grace you have been saved ), 6 and raised us up with him and he made us sit together in heavenly places in Christ Jesus,7 that in the ages to come the exceeding riches of his grace in kindness toward us in Christ Jesus 8 for you were saved by grace through faith, and that not of yourselves: it is the gift of God , 9 not of works, lest anyone should boast.10 For we are his workmanship, created in Christ Jesus for good works, which God prepared beforehand that we should walk in them. As we see it is God who has done everything for us, it is He who hath quickened us because we were dead in our sins and the dead cannot do anything my dear friends but be dead. God who is rich in mercy, because of His great love with which he loved us even when we were dead in our sins, hath quickened us together with Christ ! Not in Christ, but with Christ, right? This concept makes a difference! Paul then specifies that we are saved only by grace ( unmerited favor ), God raised us up with Him, and then we were saved by grace, through faith yes, but this, ALL this, DOES NOT come from us ( no part of this, not even faith ) is not by works. Not even faith can and should be considered “our work” even if God considers it such, otherwise we could take credit for something, so no one can or at least should not boast of his own salvation. Unfortunately, however, many boast and not a little of their faith , this is a dangerous sign of spiritual pride. Paul instead to eliminate any possibility of having somehow deserved even the reward for the works, tells us that we are His workmanship, created in Christ Jesus to do what? To walk in the good works that we have designed and chosen to do?No! Which God has beforehand ordained that we should walk in them. The works must be His and not ours, ours only lead to herd goats, His works find the lost sheep, and we must be obedient to His ways and His commandments and be sensitive to His Spirit that must guide us in His works. This conclusion leads us to see that we must not be like the shepherd of the story that has come up with anything and everything to have a larger herd to the point of having to settle for goats instead of sheep, even if his master wanted him to know the whereabouts of the lost sheep. His master had told him how to and why, but he did not follow precisely the instructions of his master, rather he wanted to do his own thing. His master knew exactly where the lost sheep were and how he had to find them but the shepherd wanted to create his flock being discontent at the expense and approval of his master and to the detriment of the health of the other few sheep of which he was responsible.In Scripture we find the solutions of all things we need to know and to all our problems, we also find the way God wants us to evangelize. Not only is the method that is the exclusive preaching of the Gospel and nothing else because this is the power of God for salvation, see Romans 1:16 but the method of God is also to be involved in the daily lives of the people around us, not as it seems good to us but being sensitive to the Holy Spirit’s guidance. We must redeem the time because the days are evil . This means taking a cue from Scripture to understand that we must be guided and directed by the Spirit of God in the works of God, that is in people’s lives when God wants to work and not at random or in our own ways or using our human methods.We must be honest with ourselves and see that in almost all the episodes in the book of Acts where there are people who are saved, preachers are in some way either guided or commanded by God to go to these places and these people, in some cases the episodes appear accidental or random but they are all guided by God and not at all by the preachers. Surely Paul, Timothy, Silas, Philip and Peter and all the others did not decide to do theatrical skits, ballets or other various things to attract people to Christ. Paul is stopped, blocked, prohibited by the Holy Spirit to preach the Gospel in Asia and is guided by God to go to Macedonia Acts 16:6-10. I wonder, I ask you, how many people have died without Christ and went into perdition in Asia because Paul did not go there nut went into Macedonia under the orders of God? Is God unjust then? No! Not on your life! As we see, however, who was to be saved in Asia eventually was. Were there in the meantime people who died without Christ because of this divine decision? Definitely! Yes! But no one who was to be saved, perished. Was God unfair then because He blocked the evangelists and sent them somewhere else knowing that people would perish and go into perdition? To you the answer! Immediately in Macedonia instead God blessed the ministry of the Gospel before saving Lydia and her house, which apparently is Lidia (by accident? Not a chance.) with other women at the time when Paul arrives Acts 16:14-15. Paul and Silas were arrested in Philippi then not even they know what God was planning, but through their presence in the prison, the jailer and his family receive salvation, first through the direct intervention of God and then the preaching of the Gospel Paul Acts 16:25-34. So we see that men of God guided by God and obedient and sensitive to God’s guidance bore fruit to the glory of God sometimes they did it willingly without being involved in the work of God were not with them their will, with their special ability or anything else to create the circumstances for the salvation of the people in question, but instead were men of God, and as Paul said, were the work of His created in Christ Jesus to walk in the good works which God prepared beforehand so that they would walk into them. What about then? Do we understand why things do not work in the church today? We understand why we can not find the lost sheep? We understand now why we are unhappy and depressed and disappointed ? We also need to quickly add in closing this topic is another important reason why often the numbers of people who REALLY are the Lord are few nowadays. We must realize that in the days we are living. We are in the last days and for a long time promises of great revivals have been promised and “prophesied” but these are not biblical. We can believe what we want, but the Scripture is clear, the general condition of the visible church will be that of complacency and illusion to consider itself rich, but instead the church is poor and naked and has nothing to offer the world Revelation 3:14-22 if it can not offer ONLY Christ, it has nothing to offer. In fact, although this one of complacency is the predominant condition of the visible church today we must take into consideration that the total image of the visible church that Jesus gives us in the book of Revelation is not one of the best. Looking at the kind of church of which Jesus has good things to say we understand what kind of church God expects us to be a church, a faithful and obedient church. We can have the right doctrine and we can have so many good things and we should have them, but if so we have to be a persecuted church and a church that is deemed poor. This is the kind of church that is rich in the eyes of God, Revelation 2:8-11 and the church that has little strength in itself, one that keeps the word of God, that is really the one that will be strong in God and will have heaven’s doors open for her Revelation 3:7-13. I wish you would take notice that in fact the characteristics of the churches of which Jesus has only good things to say, these are poor, persecuted and weak, but a church that has kept the word of God and a church that has to offer brotherly love (Philadelphia means brotherly love,in fact). God will bless us when we are churches with these characteristics and when we will not see us in the condition of the other churches that are described in these two chapters of Revelation. We are in the last days and the results we seek in evangelization can not but be in keeping with the times in which we live, things get worse regarding the human condition. Also in Revelation the Lord makes us see the image of the human being in spite of all the plagues and judgments that God sends on the earth and they do not repent of his idolatry and his sins. Yes, there will be multitudes who will be saved during the tribulation period but we have not there yet, however, that will be an extraordinary event with extraordinary results that will not be due certainly to the skills and methods of evangelization of the church. I once heard a sermon about the parables of Jesus found in Matthew 13, especially that of the sower. The parables of Matthew 13 mentioned the kingdom of God, including the church and how the kingdom progresses over time in ages. This preacher remarked at the end of the parable of the sower where the seed falls on fertile ground and bears fruit, that the seed produces a fruit that begins to produce a crop of a hundred, then sixty, then thirty. The preacher said that these numbers in descending scale could be an indication that as time passes, as the ages progress, the word of God will always produce a crop, but a crop that will decrease in number. This could very well be so and it seems to be so. Secondly, I say this, the seed is the word of God and not only and always falls on fertile ground, right? Indeed, there are four types of land and only one is fertile, then this means that only one in four people receive salvation, these numbers are not on the side of the Evangelist (the sower). In addition, who has control on the ground? The sower? No! Not the sower, what does the sower do? He sows! He does not plow, does not hoe, he sows, period! He is not responsible to manipulate the terrain nor with what methodology he can manipulate the ground. The sower is in charge of SOWING, the result does not depend on the sower nor should he feel guilty because three out of four seeds do not bear fruit. We can then understand what all this mean in relation to evangelism and church growth .It then becomes useless to become discouraged, become angry, depressed, unhappy with what God has given us to care for just because we do not see increasing numbers (of true believers) . Does it make us sad because people do not respond to the Gospel and die without Christ? Yes! It should, it makes God sad to have to judge and punish His creation. Ezekiel 33:11″Say to them: ‘As I live,’ says the Lord GOD, ‘I have no pleasure in the death of the wicked, but that the wicked turn from his way and live. Turn, turn from your evil ways! God however does not want us to have more burdens and guilt upon ourselves than we have to have. It’s His burden and He can carry it better than us! Guilt is not the right motive to evangelize. Will God hold us responsible if we do not evangelize when He tells us to do it? Well, disobedience to God is sin and it’s never a good thing even if He will forgive us for it, but we WILL NOT BE RESPONSIBLE FOR PEOPLE GOING TO HELL! As we said beforehand, God WILL NOT ALLOW ANY that He has given to Christ and for whom Christ died to perish! He will reach them somehow and they will hear the Gospel and they will believe! You can always gather the goats if you want the numbers. However, if God is sovereign and He is, if it is God who saves sinners according to His benevolent and gracious will and His power and He does so, if God wants to save ALL those who will be saved and it will be so, if only those who want to reject God and do not want to believe in Christ will go into perdition and it will be so, if all of our foolish and ignorant (biblical ignorance), designs and plans will only gather goats in the flock, and if only the preaching of the word of God guided by the Holy Spirit produces true salvation , that what are we angry for? Why are we unhappy? Why envy the many goats others have instead of caring and nurturing the true sheep God gave us to care for?God is at work in His church, we just have to be obedient and faithful to what God has called us to do. If we have to put our house, the church, the fold in order let’s put it in order! Let us be faithful and obedient to what God’s Word instructs us to do, and remember that in what days we are living. Are we happy to have this great privilege that God has given us? Do you want to change your life forever, the church, your attitude? Pray to the Lord every day that He send you Himself His lost sheep and you will see that you will find them and grow the flock. Pray to the Lord to lead you to who He wants to give salvation and to guide you in His works which He prepared beforehand for you. Pray that give you the power and boldness to declare His word , His Gospel and you will see that you will be much happier and satisfied (see Acts 4:23-31) even IF there will not be mind-boggling numbers that will invade your churches. Remember what Paul said dear brothers:1 Corinthians 15:58 Therefore, my beloved brethren, be steadfast, immovable, always abounding in the work of the Lord , knowing that your labor is not in vain in the Lord. Our labor is not in vain in the Lord even when there are no large numbers and large ministries, we remain steadfast, immovable always abounding in the work of the Lord and abounding for the glory of God and not for ours!